I flew in from Mexico’s 85 degree weather to Utah’s 23 degrees and a blanket of snow. Winter is here. I love the snow in December, but by March it gets a little old. I am comforted by knowing that it can’t last forever. Knowing that things don’t last forever is my source of hope for the next 6 weeks. I came back to Utah over the weekend to start the process for my second transplant. I left my husband and kids. I was just starting to feel better. My hair was growing back. And now, I will do it all over again. My treatments started yesterday with a full day of tests. The testing marathon began at 7:30 a.m. with a heart test where I was injected with radioactive material for a scan. Next was another bone marrow biopsy. (Memo to self: get the double dose of conscious sedation like last time because there was still a lot of crying this time.) I had labs drawn. My next stop was a PET scan. It is slightly nerve wracking to be led to an isolated room with a radioactive material symbol on the door and to have a dangerous substance be pulled from a lead-covered canister and injected into me. Something about that just feels wrong. My last test was a pulmonary function test with an arterial blood draw (worse than an IV but better than the biopsy). I finished the day at 5 p.m. It was a hard day for me. I tried not to let my challenging day spill over onto the people around me. They could still have a great day, but I gave myself permission to have a bad day on occasion and to be guilt-free about it. The best part about bad days are that they don’t last forever. Time passes, we do hard things and we get through them. Today is a new day and I can see a light at the end of the treatment tunnel. I can have a rough day and still be grateful. I have gained the weight I needed (thank you empanadas). I am healthy (thank you for your prayers). I had a friend’s hand to hold (thank you Sharon). My family is coming for Christmas (thank you airlines). With the doctor’s go-ahead, I will start chemo in the next few days. In the coming weeks I will feel crummy, but in a few months my two transplants will be over. I will start to feel better, I will be reunited with my family and my hair will start to grow back. I am discovering that enduring is more than just waiting. I have to grab the opportunities I have in the circumstances that I have them. It is time once again for more reading, more resting and more learning. Eventually the snow will melt, the flowers will grow and I will be able to wear open toed shoes once again (with hair). At last I am home with the family in Mexico! What a thrill to be here for a few weeks after being away for almost 3 months. It has been a week of doing favorite things – reading stories to the kids, snuggling with them at night time, date nights with Paul, seeing friends, and of course, eating my way through Monterrey. Some people think we are crazy to live in Mexico, but it has some distinct advantages – friendly people, sunny weather, palm trees, and the best tacos in the world. First, the people. 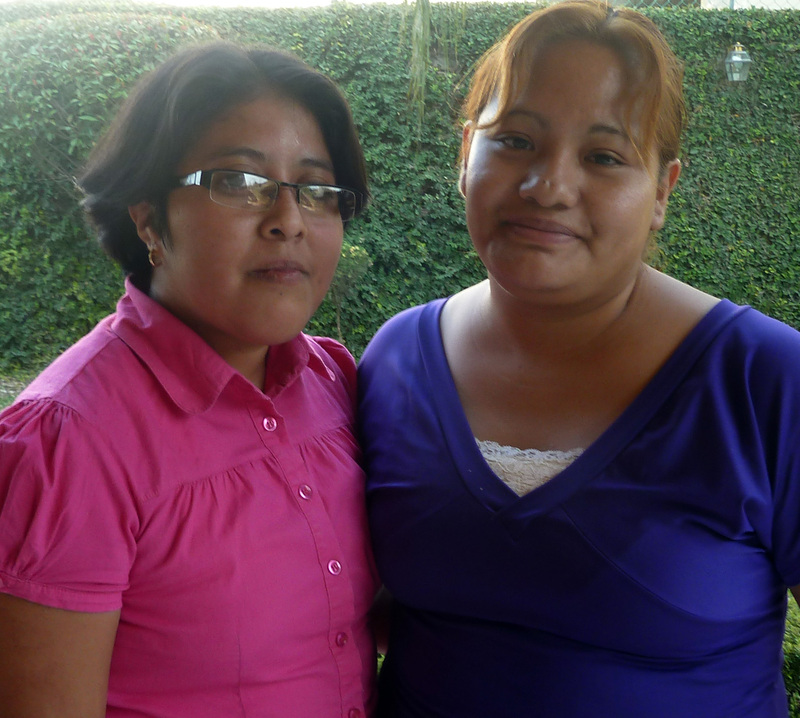 We would not be making it without Angie and Cecia, our Mexican angels. We adore these women and are so grateful for their service. They are happy, inspiring women. They keep things running smoothly at home and care for everyone – our family in addition to Paul’s work staff (who are now officing downstairs). The people of Mexico are supremely gracious and have a warmth that is heartfelt and genuine. The only way I can describe their loving nature is that they put people and relationships first. The teachers at the kids’ school are kind and loving and have given the children extra attention. I receive an email with a photo of Reed each week from class, so I can stay connected with my son. Our Mexican friends have gone out of their way to help us in any way they could. Paul’s business associate traveled all the way to Europe to obtain holy water for a close relative. When he ran into Paul’s partner in the airport, he gave him the holy water for me. I saw him the other night at a dinner and couldn’t hold back the tears in gratitude for his kindness. Without fail, our friends in Mexico say that their family is praying for us. What beautiful people. Now for the food. With doctor’s orders to gain weight before I start my next treatment, I am totally justified in sampling the best Monterrey has to offer . Since you can’t be here, I will take you on a quick tour of my favorite eating establishments. 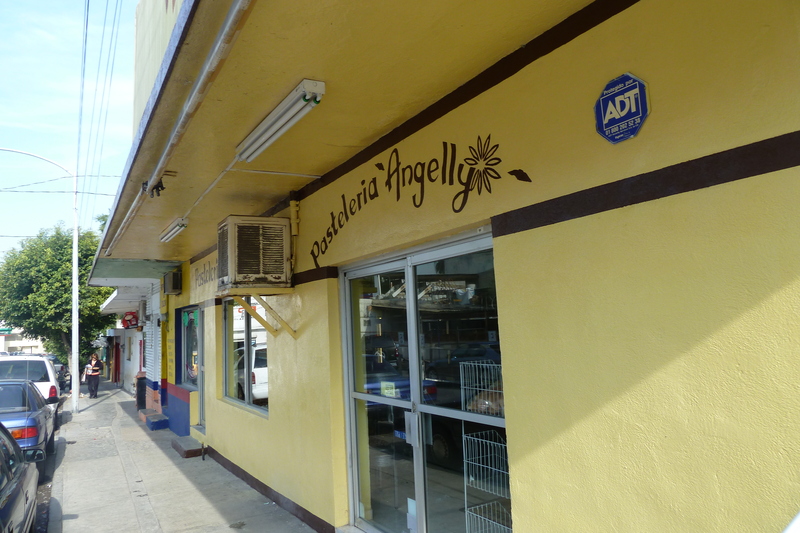 Here’s my favorite bakery, with the best empanadas anywhere. Manzana (apple) or pina (pineapple) are my favorites. 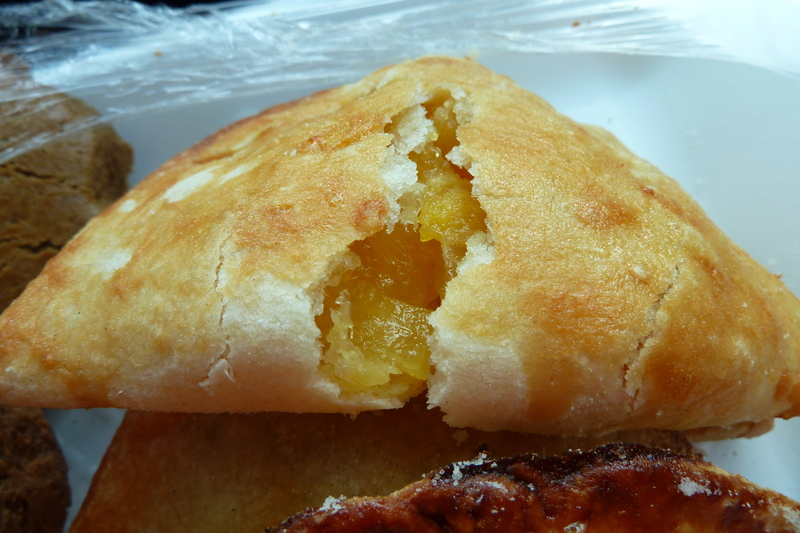 Most of the pastries in Mexico are too dry for my American taste, but these empanadas are just right – not too much crust, lots of filling, and freshly made. The kids now enjoy the tacos as much as Paul and I. 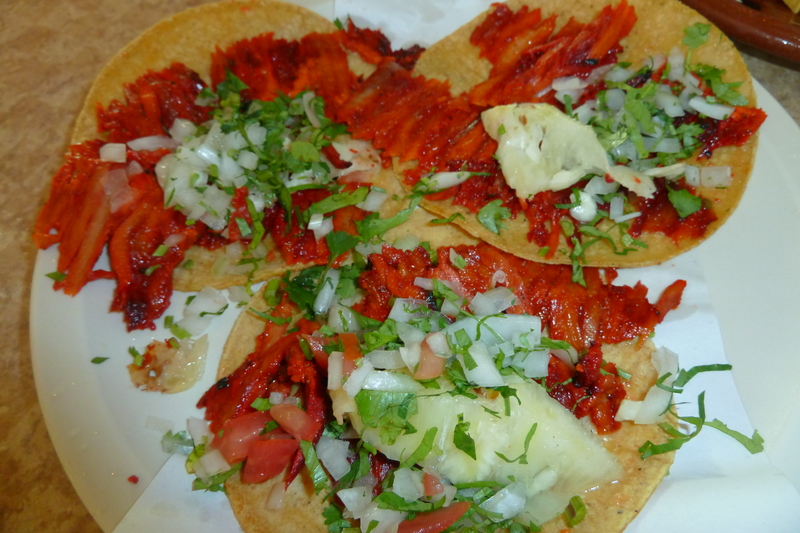 They like “authentic” tacos – meat, lime, onion, cilantro and salsa – never any beans, sour cream or cheese. Most of the kids like the corn tortillas, but Sam is still a holdout for flour. Both are divine. They order a Fanta or Manzana (apple) soda in a glass bottle. We stay away from soda in the states, but in Mexico, we let them because it just feels right. The kids’ favorite place for a treat is Al Fresco’s, where you can get Italian gelato, or Orange Cup, where they have ultra-healthy frozen yogurt. Ice cream in Mexico is sub-par judging from what I am used to, but they do have a Haagen-Dazs and a Cold Stone if you are feeling nostalgic for American ice cream. For a fancy treat, we stop at Binny Brunn. Their chocolates are fabulous. Everyone is very gracious in Mexico and brings gifts when they come to your home for a party. 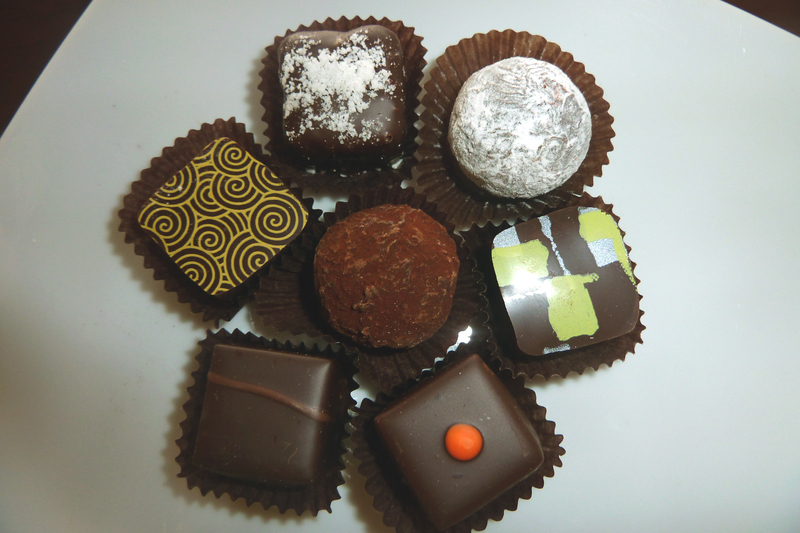 Someone brought a box of these one time to our house, and I think they are the best chocolates I’ve ever had. Enough about the food. Although food can be part heavenly, real heaven is being with my family. I can’t imagine being without them. Even if I can’t do much in the way of activity, I like just being close to them. I am still recovering and resting, and (sort of) taking my sister’s advice: “Always be in bed when they get home from school.” They are so stinking cute that it is hard not to get pulled back into their world of school, homework, friends, driving, and other activities. 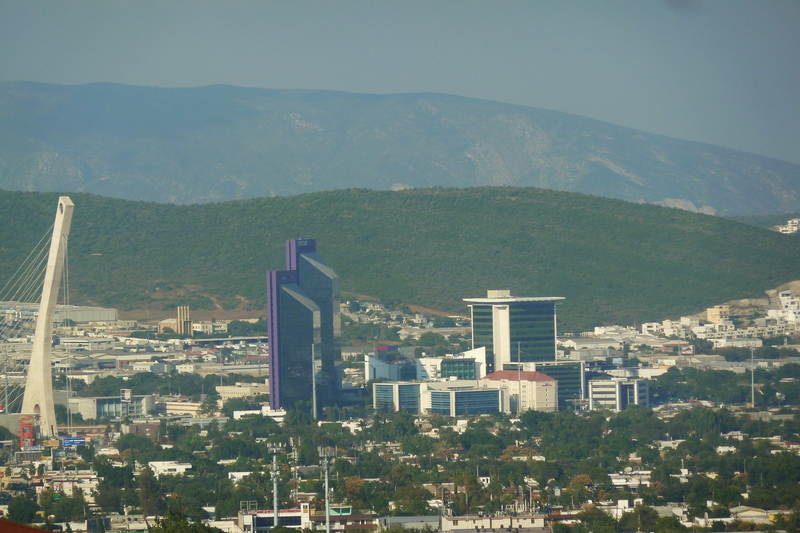 One of the blessings of living in Mexico is that their world is expanding. Neal is teaching me new words in Spanish popote (straw) and se acabo (all gone) and wants to tell me all about his friend Jose. In fact, he proudly announces on a daily basis that “Today I played with Jose and I did NOT punch him in the face.” Reed speaks Spanish around the house and Pablo is completely fluent. Clark and Sam complain that they are not learning enough Spanish, but they play Spanish games on Dad’s Ipad to pass the time and are better at Spanish than they think. Former intern and friend James used the Pimsleur CDs and was fluent by the time he came to Mexico, so maybe we will try that next. I will enjoy my next two weeks with the family with all of its motion. I am just glad to be home. I am about to go back to see my family for almost a month. I can’t wait! Being away from my family has been so strange. I miss them so much, but I have needed time to rest and to heal. After 15 years of mothering, it is odd to be given such a large block of time right in the middle of my parenting. I am used to being in motion – fast and constant. Having an entrepreneur husband and six kids accounts for much of the motion, but I have an overachiever personality to boot, and have added activities and projects to my already full plate. My life was full of appointments, schedules, expectations and responsibilities. Cancer has forced me to drop them all. I would have never set my stewardship down voluntarily. It had to be literally taken out of my hands. The world of cancer has a different pace. Cancer treatments take time and are unhurried. The treatment process can span months and years. There are times of pain where survival is the only aim. Recoveries are slow. Family and friends help to take over responsibilities that can no longer be handled alone. Priorities that were once paramount shrink to nothing. Outside pressures and expectations diminish. Kind people encourage rest and healing. So what will I do with all of the time? I could entertain my way through it, but I have a gut feeling that I won’t learn the lessons I need if I fill the time with diversions. I could take up a new hobby, but that didn’t work out so well either. One day, Sharon and I saw some a cute hand-knit scarf in a store. They were a a simple rectangle design with one buttonhole on one side. “This would be easy to make,” we both said. Never mind that neither one of us knew how to knit, nor had I crocheted anything since I was 9. We tried to find a yarn store and then went home in a moment of strength, telling ourselves we didn’t need a new project. We both had plenty of work (Sharon’s photography) and interests (my reading and writing). As a mother, I know how precious and scarce quiet time really is. Why did I fill this rare resource with extra, unimportant busyness? In the case of the scarf, I think I allowed my busyness to define me. If I am busy, I feel more competent, talented, valuable or important because I am creating or producing, even though the produced product has little or no end value whatsoever. What starts as work towards a noble goal becomes a long list of tasks, with no regular system of measurement in place to see if the goal is actually being achieved. Sometimes I just want to be “done” so I rush through the motions to get to the end, when there is really no true end, only “enduring to the end.” In the rush, I usually miss the moments that mattered. Living with scarcity is almost easier than living with prosperity. There are SO many choices. I think I might have nagging regret that in picking something up, I had to put something else down. Choosing my “best” thing means that I will miss out on something interesting, urgent or important. Cancer brought me to a screeching halt. Stepping out of my daily routine for a long enough time has taught me a thing or two about being busy. Haste destroys inner peace and leaves no time for reflection or contemplation. Haste fails to prioritize. Everything is urgent and important. Haste closes our eyes to simple gifts we receive every day. We fail to look up and see the beauty of the ordinary, our noses buried in our long to-do list. Haste brings impatience, which damages relationships. Eye contact, conversation, listening, courtesy and graciousness are lost in the rush to get to the next thing. (Sigh.) Cancer has made me tired of being in a hurry. Knowing how rare quiet time will be in my life, I am taking advantage of being still. I have surrounded myself with silence, ready to be taught new lessons. I have visited with friends and enjoyed their company. I have written letters to my children. I have read good books and listened to music that brings me joy. I have walked through beautiful neighborhoods and driven up canyons just to enjoy the leaves. I have enjoyed time in the hammock in the back yard. Being in nature, especially, has been uplifting and healing. It was in nature that Thoreau was able to find more white space in his life. “I love a broad margin around my day,” he writes. Giving your self a broader margin certainly seems easier to do if you are alone in the woods for a year, but Thoreau had the right idea, even for normal family life. Nature plays at a different tempo than we do. Living differently is possible – I’ve seen people pull it off. My role models are men and women of character and accomplishment. They do not seem to be frantic people in a hurry. They have an unfailing sense of purpose and work steadily every day to accomplish that purpose. They take time to plan and prepare for the day ahead. They pray for divine help and dedicate their efforts to their Creator. They are realistic about how much can be done in one day. They are gracious and thoughtful. They do the best they can, and have faith that it is enough. Learning to do this for myself will be my next discovery. I am grateful that cancer has helped me see things differently. Living differently will be the ultimate reward.